Cook fluffy, thick waffles for your hungry customers with the Carnival King WBM26DGT double belgian waffle maker! This double waffle maker features 1100W of heating power on each side to make quick work of your signature waffles and keep up with your busiest hours. Each side boasts independent intuitive digital controls and a convenient audible timer so you can set the time, close the baker, and carry on with other tasks around your busy kitchen or concession stand. Or, during slower periods you could also choose to operate one side at a time for added energy savings. Plus, the ergonomic cool-touch handles are an added safety feature that help prevent burns. Each side features two aluminum grids with a non-stick coating, allowing you to create waffles up to 7" in diameter while providing a clean release that allows guests to enjoy every last bite! 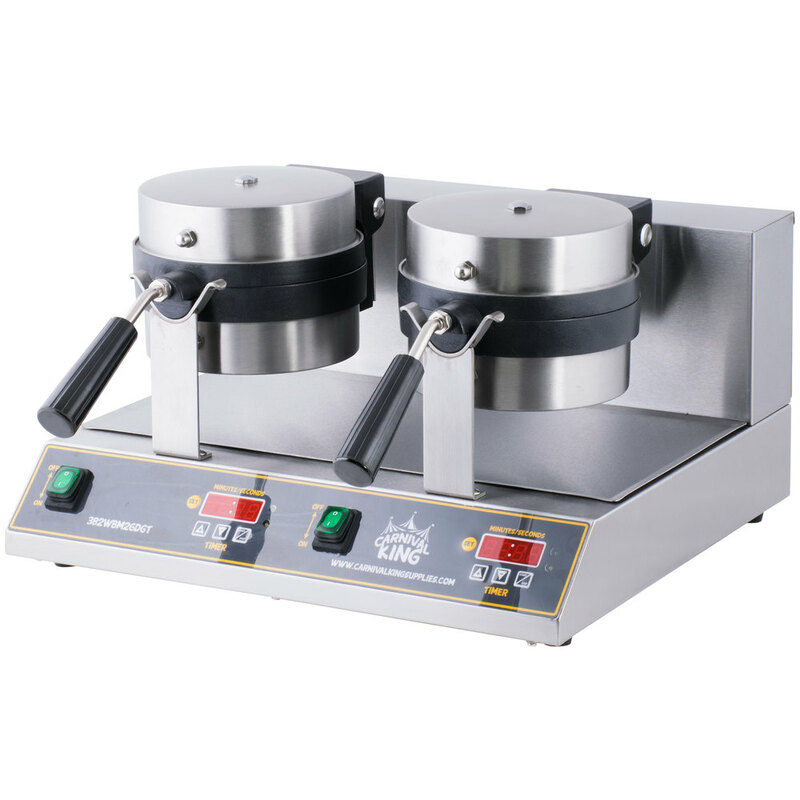 Its efficient cooking system combines with a rotating design to ensure the consistent, even baking of up to (40) 1 1/4" thick waffles per hour. The temperature is adjustable up to 445 degrees Fahrenheit and, with bright orange indicator lights, it's simple to identify when the unit is heating up. Conveniently located lighted green switches always lets you know when this waffle baker is powered on and, thanks to its heavy base and non-skid feet, you can be sure this unit will stay in place when in use. The removable drip tray catches overflow to keep your countertops presentable and expedite cleanup. This unit requires a 120V electrical connection for operation.